Anyone who enjoys a warm beverage now and then (or daily!) is sure to appreciate these fairies and friends! The set includes ten figurines based on artwork by Amy Brown. 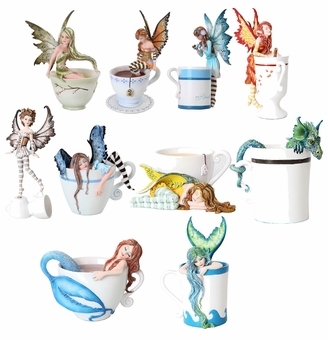 Fairies, dragons and mermaids lounge in and around cups of coffee, tea and cocoa! The only thing that makes a cup of hot, freshly brewed java better is when it comes with a little pixie pal!